Photography is a struggle. Wherever I am on the learning curve, the goal is always to figure out how to take the next step, how to find the next handhold and inch that much farther upward. Of course, some of the steps I take are missteps. As Woody Allen put it, "If you're not failing every now and again, it's a sign you're not doing anything very innovative." Most photos that I take fall in one of about four buckets. "Awesome," "decent," "bad," and "delete immediately." And as always, there are plenty of photos that are on the borderline — a decent photo that's also out-of-focus might end up straddling the "decent" and "bad" classifications. A "near-miss," though. For me, a "near-miss" is a photo that is bad, but is very nearly awesome. And they're the most frustrating. Take the photo above. I shot that during a recent day-trip to NYC. I really, really like the composition, the exposure, the moment… but the guy's head is missing. The framing mistake totally kills the photo. What's most frustrating about the near-miss is that it seems the tiniest of changes would have fixed things. For me, I learn from the lesson and move on, but questions about the photo seem to linger in the back of my head. In the photo above, if I had framed a little higher, or taken more than one shot, or… so many questions. This photo has haunted me ever since I shot it in November of 2007. 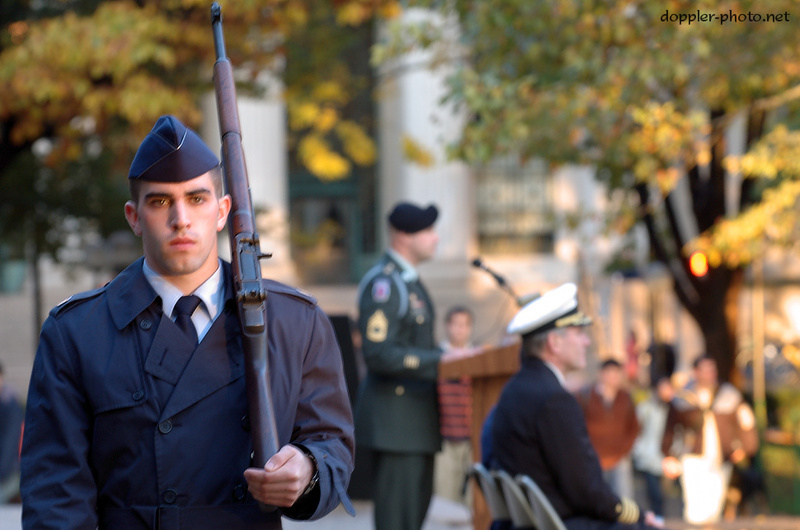 First, the caption: "U.S. Air Force Cadet Nathan Elowe (Tufts University) slowly marches across the MIT Student Center steps during a remembrance ceremony held Tuesday afternoon. The Air Force, Army, and Navy Reserve Officers' Training Corps programs held the ceremony to remember prisoners of war and soldiers missing in action." I had long wanted to capture a powerful, meaningful, well-executed photo from this annual ceremony. I had tried and failed in 2006, and this would have been my last chance. In 2007, I finally found a shot, and when it was time to click the shutter and capture it, something went wrong. Great moment, nice composition, poor execution. Specifically, there are at least two ghost images that, due to their sharpness, are noticeable and visually displeasing (for instance, look at Elowe's ears in the large version). First and foremost, know your equipment. Had I used my own lens instead of borrowing one, this wouldn't have happened. Had I been used to the borrowed lens, this wouldn't have happened. Had I even tried to make this lens work like my own (by disabling VR), this wouldn't have happened. If you don't know your equipment, expect things to go wrong. Try to capture more than one good frame so that when something does go wrong, you have backup frames. In this case, I only had this one with the focus in the right place. If you shoot with in-lens vibration-reduction (Nikon) or image-stabilization (Canon), realize that if you hit the shutter without waiting for it to spin up, you will get double-images like this. It will be noticeable. If you have a near-miss in any situation, learn from it. Even if you can't let it go, learn from it.